As this critical year unfolds, we at Inside the Greenhouse are as determined as ever to work to meet people where they are and ‘re-tell climate change stories’ from a range of perspectives. Through this commitment we seek to help make sense of 21st century climate challenges. 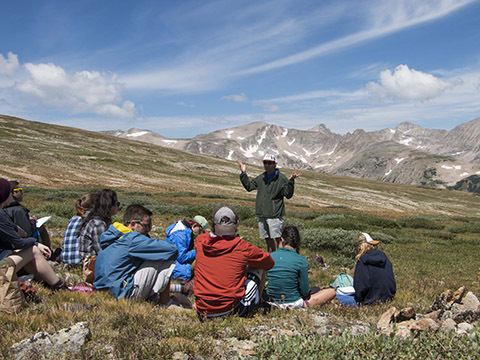 As a key part of our ongoing efforts, we remain steadfast in our commitment to help students build confidence and competence in order to deepen our understanding of how to effectively address issues associated with climate change. So far in 2017, among many research, teaching and other endeavors, students in our Spring semester course carried out 2017 ‘Stand Up for Climate’ comedy night experiment, culminating in a live performance at historical Old Main Theater on the campus of the University of Colorado (CU) Boulder in March. Along with this event, we successfully carried out our 2017 International Comedy & Climate Change Video Competition in collaboration with the Center of the American West. Also, our students successfully conducted ten more interviews for the More Than Scientists (MTS) project, featuring important scholars and practitioners in the Boulder area. Inside the Greenhouse participants have now produced more than three dozen interviews through this collaboration. And, through a new partnership with Boulder-based Recycled Runway, students from our Spring course were matched with Recycled Runway youth designers to tell their stories of material choices and motivations through short videos of sustainable fashion sewn in with creative expression. Recycled Runway, a program dubbed ‘teens transforming trash’, held their impressive 8th annual fashion showcase at the sold-out Boulder Theater on April 18th. For an after show gathering, on May 7th Inside the Greenhouse then hosted Recycled Runway for film showings at the CU Museum of Natural History (see below for more about the event). As we continue to carry out these projects through wonderful collaborations and partnerships linking campus and community as well as the local with the global, support from you is vital. Please visit our donation page to provide a tax-deductible gift. Any amount helps us as we move forward with our work. This Spring 2017 semester at CU Boulder, Beth Osnes and Max Boykoff co-taught the second course in our two course Inside the Greenhouse series. The interdisciplinary course is called ‘Creative Climate Communications’ and is cross-listed between the Environmental Studies program, the Department of Theatre and Dance, and the CU Boulder Atlas Institute. Garrett Rue (alum from the 2012 Inside the Greenhouse course) helped as our Teaching Assistant while Barbara McFerrin (alum from the 2014-2015 Inside the Greenhouse course series) worked as our More Than Scientists composition coordinator and general Adobe Premier mentor. And intern Tara Riedl joined us from the Arts and Sciences Support of Education through Technology (ASSETT) to facilitate the Green Suits your City project. The class projects through the term – More Than Scientists, Green Suits Your City, Stand Up for Comedy and Recycled Runway – punctuated a busy semester of reading discussions, creative brainstorming sessions and other activities. Throughout the semester, students appraised and extracted effective methods and techniques through roundtable co-facilitation of peer reviewed research on climate communication and public engagement. Participants in the course worked to deepen their understanding of how issues associated with climate change are/could be communicated most effectively, by analyzing previously created expressions from a variety of media and then creating new artifacts and compositions. Class visitors – including Jenny Barchfield (Ted Scripps Fellow, CU Boulder), Professor Peter McGraw (Psychology and Marketing, CU Boulder), Professor Zoe Donaldson (Department of Molecular, Cellular and Developmental Biology, CU Boulder), and Carrie Howard, Jane Saltzman and Ian Gibbs from the Front DeRanged Improv Comedy Troup – provided additional perspectives and insights to galvanize our efforts. Together, these compositions and activities all aimed to challenge students in the course to engage creative climate change storytelling through multiple modes or systems of communication and to consequently inspire productive public discourse on climate change. Left photo: Students and instructors working in ATLAS Black Box theater to prepare their performances for the ‘Stand Up for Climate’ comedy night experiment. Right photo: Students working in the classroom with guest Jenny Barchfield from the Ted Scripps Fellowship program in the Center for Environmental Journalism at CU Boulder. Photos: tudents and instructors working in the ATLAS Black Box theater with Carrie Howard, Jane Saltzman and Ian Gibbs from the Front DeRanged Improv Comedy Troup. Left photo: Rehearsal in Old Main Theatre for the 2017 ‘Stand Up for Climate’ comedy night experiment. Right photo: Spring 2017 course Teaching Assistant Garrett Rue amidst class team building activities. On a Sunday afternoon, local middle and high school fashion designers came to see the premiere of short films about them and their artistic process. Hosted by the CU Museum of Natural History, on May 7, 2017 students in the Creative Climate Communication Course joined designers and their families to share the films they had made chronicling the process of each young designed and highlighting the product—an outfit made entirely of recycled materials. This event included thirty-three 2-minute films, featuring young designers who participated in the Recycled Runway Fashion Show at the Boulder Theatre and featuring the process and the larger Recycled Runway endeavor. Photo: Gathering at the CU Museum of Natural History for the showing of the CU students’ films to Recycled Runway organizers, designers and their families. At the wildly successful April 18 sold-out event at the Boulder Theater in Boulder, Colorado, young designers presented their original garments that were comprised of found and recycled materials. The event at the Boulder Theatre brought out the community in full force to celebrate this innovate approach towards sustainable living. Our students filmed the event onstage, backstage and around the theater in order to capture the excitement and energy, the process and the final event, along with the personalities of each young designer. Photos: Scenes from the Recycled Runway 8 event at the Boulder Theater (credit Glenn Asakawa). Left Photo: Scenes from the Recycled Runway 8 event at the Boulder Theater (credit Glenn Asakawa). Right photo: CU student Alex Doyle – who led the team of videographers on the evening – setting up a shot in the Boulder Theater. Left photo: CU student Grace Kendziorski filming backstage at Recycled Runway 8. Right photo: CU students Matt Milne (left), Grace Kendziorski (center) and Sam Szabian (right) working on filming backstage at Recycled Runway 8. Left photo: CU student Matt Milne filming the action at Recycled Runway 8. Right photo: CU Students Jesyca Lazo (left) and Erica Nied (right) at the Recycled Runway 8 event, waiting in anticipation for their short film about the process of Recycled Runway 8 to be shown to open the sold-out event. Left photo: Peter Patrakis and Dan Dodero working with designer Elizabeth Roth at Common Threads. Right photo: Some of the CU students and instructors paused for a photo at Recycled Runway 8: (from left to right) Connor Vertrees, Max Boykoff, Grace Kendziorski, Beth Osnes, Alejandro Alvarez, Sam Szabian, Alex Doyle, Garrett Rue and Matt Milne. Together, the CU students’ films effectively portray the incredibly charming and impactful Recycled Runway project. When Beth Osnes and Max Boykoff first told students in the Spring 2017 Creative Climate Communication class that they would be making a film about a middle or high school designer for an event called Recycled Runway, one student raised her hand and asked “Why are we doing this?” After going to the Common Threads to interview her assigned designer, volunteering to shoot footage from back stage during the event, and editing her film into an outstanding composition, when she spoke on behalf of the assignment at the CU Museum event, she showed how she learned by doing the project as she described the importance of her efforts in carrying out her work. My work with inside the greenhouse has been a huge catalyst in shaping the direction I want to go in life. I've always been incredibly interested in science communication, especially as it grows increasingly important in modern society. But in the past, my sole medium of communication was through writing. Inside the Greenhouse, through its Film and Climate change course, has provided me with an invaluable skill set that allows me the opportunity to communicate science through another, very powerful, medium; film. Since I have finished this course, I have been honing my craft in film and photography and hope to use these skills to communicate the incredibly important realities of climate change, in a manner that reaches the common person. The Climate Change Through Film course encourages thoughtful interaction with topics surrounding climate change and allows you to approach them in a hopeful and encouraging way. This sort of approach allows you to then communicate these ideas, while maintaining a certain level of positivity necessary in encouraging change. 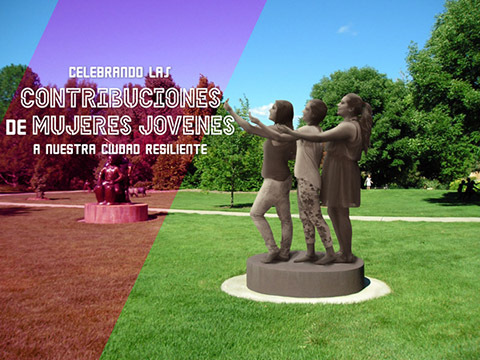 Imagine having statues of young women in our civic centers that express the qualities guiding our city towards greater resilience. The above photo is a result of an activity that invited young women to make sculptures with their bodies doing just that. Those poses were photographed in front of a green screen and then edited onto photos of civic areas in Boulder County. Beth Osnes and Rebekah Anderson have been working together for years developing opportunities for young women to share their perspectives, needs, and contributions to increase their city’s capacity for resilience. 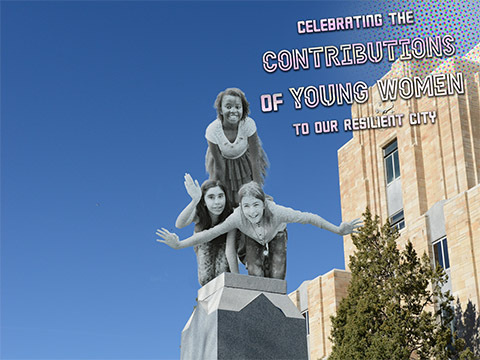 They have been doing this by developing creative activities that specifically invite young women to participate in their city’s plan for resilience. They have created recipes for each of these activities that are shared on the Growing Up Boulder website. Also shared on this site is the documentation of the various works of art created by young women in Boulder and the Navajo Nation. This has been in collaboration with Inside the Greenhouse and, more recently, Growing Up Boulder. It’s been a very busy academic year for Rebecca Safran! The fall 2016 term ended with the annual climate change and film festival. According to Becca, the election has turned everything upside down in many ways, but the silver lining is the ignition of activism and the inspiration to continue our great work at Inside the Greenhouse. As an evolutionary biologist and academic scientist, there are many opportunities to travel for conferences and research. These trips are vital to staying connected with her scientific community but have also provided the experience of how other cultures confront the urgency of climate change. In April, Becca co-organized a Gordon Research Conference on the Evolution of New Species in Tuscany Italy. She and her lab group had a day in Florence on the way home. Rebecca finds that it’s hard not to feel inspired by science and discovery when walking through the Galileo museum or climbing to the top of the Duomo. She also noticed that food vendors in Florence’s central marketplace don’t rely on throwaway containers or packaging, and she didn’t see huge garbage cans toppling over with paper and plastic waste in these public spaces. 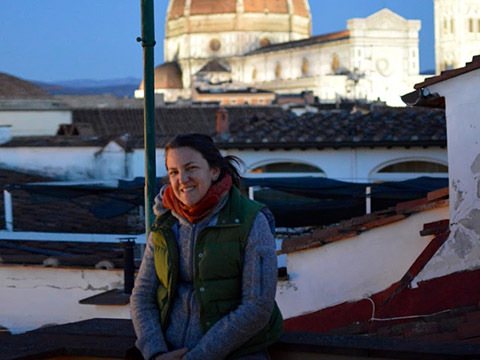 Photo: Becca Safran in front of the Duomo in Florence, Italy. Her recent trip to attend a workshop on Biodiversity in Sweden was inspiring to her for a different set of reasons: a pass for the public transportation system not only takes you all over the city and country, it also takes you on ferries to nearby islands on the Baltic! She found that many people don’t own cars – and they get along just fine. Rebecca is now traveling across a route through the northern Tibetan Plateau in China where the birds she and her team studies breed side by side with humans in settlements dating back to the era of trading along the Silk Road. She will keep us posted through our Inside the Greenhouse blog as she experiences some of the most densely populated locations on our planet (Hong Kong and Beijing) and some of the most ancient human settlements in central Asia. This spring, Inside the Greenhouse participants have led information-sharing and participatory workshops as well as giving talks involving creative climate communications. Among them, co-director Max Boykoff spoke about Inside the Greenhouse in a session on ‘Geographies and counter-politics of humor amid adversity’ at the Association of American Geographers conference in Boston, Massachusetts in April.